One of the challenges retailers have, is building displays that makes the customer stop, look and pick up products. How do we build “powerful” displays? The following tactics may encourage more of your customers to stop, look and touch when it comes to product displays in a store. If you build displays that are full of items the consumer is familiar with, the chances are they will not stop and have a look. Put the familiar products with the unfamiliar, not only will they stop and look, the chances are they are more likely to purchase the familiar items. That’s the “stopping power” working in action. Colour makes a lot of diffrence. In Australia we recently celebrated “breast cancer” day This is a day when participating retailers contribute a percentage of profits to the research of this disease. 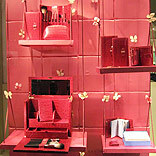 It is also a time to create “powerful” displays, using harmonious pink colours to catch the eye. At other times you may want to use contrasting colours to create the “stopping power”. The key is not to use colours that are in coordination with the colours of the products displayed. You only have one opportunity to stop and make a customer peep into the store. On their second visit to your store, the chances are that they will not stop, because the display is now familiar to them. Change the displays based on how often the customer visits the store. If the average is monthly, change the displays monthly, if it’s weekly, change the displays weekly. Perceptive retailers will have a display roster to introduce constant changes in their business. It is difficult for anyone to come up with new ideas on how to build displays very often. Original thought is a real challenge. But, there is nothing wrong in getting ideas from other retailers and introducing them into your own retail situation. Most of the leading retailers are following this trend today. Walk down the main street of any major famous city and look at the shop windows. Take photographs of their window displays and incorporate that idea for your own display window. Look at the props they use and how they use them. You can personalise the idea and format your own store. Don’t just put product on display as a commodity retailer. People don’t buy products just because they are products. They buy them for numerous reasons; to cheer themselves up, to beautify their home, to add value or any other host of reasons. As a retailer, your role is to hit the hot buttons. All “stopping power” displays should provide ideas and solutions, not just product. You may not have the time to physically talk to every customer, but the words you use on point of purchase signs or on displays do have the opportunity to talk to every customer. Use this as an opportunity to communicate with your customers. Finally, listen to your customers. They will tell you what they like, dislike and what to change. Consumers can be your best friends in helping you grow your business. Putting these practices into place will help you connect in a better way with your customers who will in turn help you to move up on the sales ladder. John Stanley (CSP) is, an acclaimed retail consultant . He is author of several marketing, customer service and retail books including the best seller “Just About Everything a Retail Manager Needs to Know”, his company is WA Small Business Champion 2009 – Educational Services.